As a Designer based in San Antonio,Texas. transforming garments and textiles from mid-century to current into ready to wear fashions. I Repurpose and reuse to create original green clothes into modern context from what already exists. as A DJ, Music inspires my Fashion, therapy for my soul, I am an early adapter of new indie sounds with my series "you heard it hear it first" & "Indie Street Beat" during my residencies at different venues in San Antonio. Handling the production values of our next event, along with Sarah Castillo and Maria D. Garza. 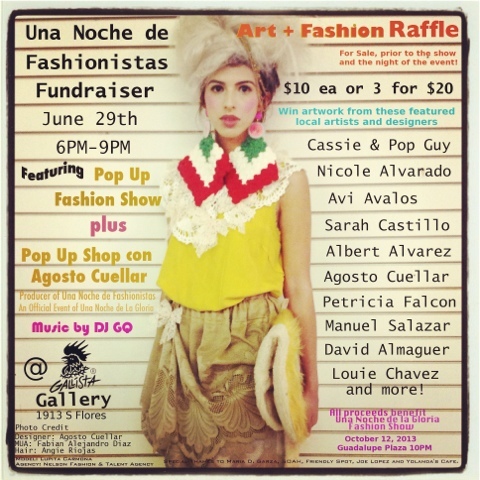 A fundraiser called "Fashion Night Out:SOUTH", this Saturday at Gallista Gallery in the SloFlo district of south San Antonio. Raising awareness of local design talent thru fashion..and finding funds to support our big show during Fashion Week:San Antonio in October, Friends and supporters have contributed artwork to be raffled that evening, So thanks to all the many artists who have contributed to this event. Much Love & Respect. This is the final push week and going to get hectic ...no doubt..thou LOVE WHAT I DO!